Baker Fairview Self Storage, in Costa Mesa, California, provides self-storage options for individuals and businesses, including records storage and vehicle storage. 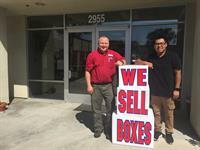 Our managers are self-storage professionals who know the business inside and out. You can count on them for expert guidance and service. Call or come by today and let Baker Fairview Self Storage take the frustration out of finding enough space for all of your things!